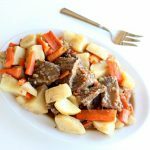 Instant Pot 5-Ingredient Pot Roast Dinner–a chuck roast is cooked until moist and tender in an hour in your Instant Pot (mine was frozen!) along with seasoned vegetables. The meal is finished off with homemade gravy. This is one of those meals that just brings me back to Sunday dinner at Mom’s or Grandma’s house. The roast, potatoes and carrots all on my plate and then I cover them with a ladle-full of gravy. 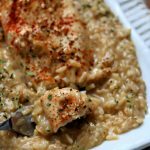 My version is so so so easy because we use the Instant Pot and only 5 ingredients. And guess what else? I didn’t even thaw my roast. It was totally frozen. For people like me that NEVER remember to thaw meats the Instant Pot can be a lifesaver. Because the meat takes a lot longer to cook than the vegetables I put it in the Instant Pot first. I let it cook for an hour and then I add it in the vegetables for a quick 5 minutes. This ensures that the veggies aren’t overcooked and mushy. Yes this is a little bit annoying but trust me you do not want your potatoes and carrots in there for an hour. They’d be like baby food. For this Instant Pot 5-Ingredient Pot Roast Dinner I used my 6 quart Instant Pot Duo 60 7 in 1. I also own the 6 quart Instant Pot IP-LUX60 V3 Programmable Electric Pressure Cooker. They are both great pressure cookers! The first one I mentioned has a yogurt making function but other than that they are fairly similar. The price difference between the two is about $20. Pour the broth into the bottom of your Instant Pot. If your roast is frozen, place the trivet in the bottom of the Instant Pot and then place the roast on top of the trivet. If your roast is thawed, you can place it directly in the bottom of the Instant Pot in the broth. Scoop the vegetables and arrange on the sides of a platter. Slice or shred the meat and place on the middle of the platter. Salt and pepper to taste. Prepare the gravy by using the liquid left in the Instant Pot. Turn the Instant Pot to “saute.” Mix 2 Tbsp cornstarch and 2 Tbsp water in a small bowl and then stir the cornstarch slurry into the Instant Pot. Whisk the mixture until it’s smooth. Continue whisking until the gravy is thickened. 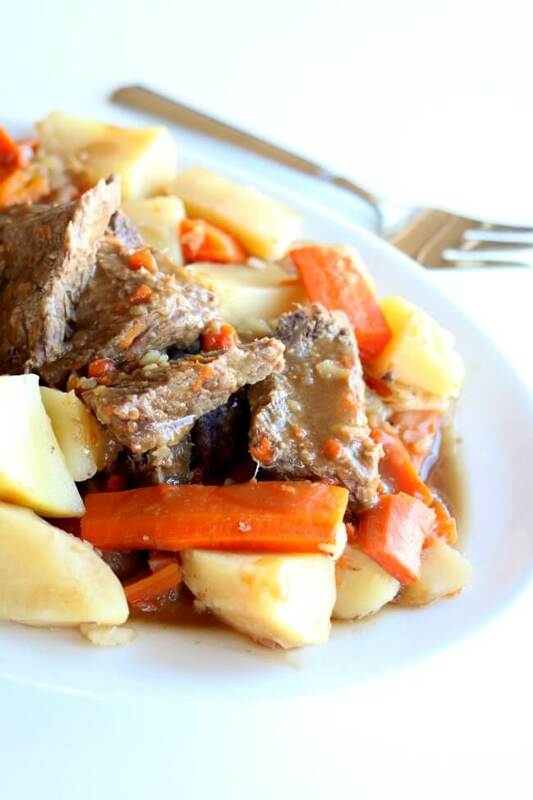 Serve gravy with the roast, potatoes and carrots. Now for the recipe it says 1 3/4 cup of broth…this may be a stupid question but is that 1 and 3/4 or just 3/4. This was great! I had 3.5lb completely frozen roast and cooked for 90 minutes and my family raved about it! Oh man! Just made this recipe and the smell is permeating the whole house. Can’t wait for dinner tonight! Doesnt quick releasing it to put the veggies in dry it out though? The additional pressure cooking time for the veggies, and subsequent natural release, seems to fix this. My roast was not dry at all. I also added several crushed garlic cloves, a couple sprigs of fresh thyme, and a couple bay leaves. Delicious! Hi there. I was wondering if I used frozen veggies…a Normandy blend (broccoli, cauliflower, yellow & orange carrots), what would I cook the veggies at after adding to pot? Also I’m using a 4lb roast, so should I double the seasoning? I’m using organic no salt seasoning from Costco. By the way I’m loving your recipes for my new pressure cooker! Thanks!! I feel like frozen veggies are blanched and would need less time. Just add a minute of pressure cook time. I had a 3.5 lb roast. I set it for 90 minutes, did a 20 minute NR, added veggies, cooked for 4 more minutes, then got distracted and ended up doing NR for about an hour (LOL). Nonetheless, it was absolutely PERFECT! Thank you! Haha! that happens to me a lot! I cooked a 5 lb Chuck roast with bone in it from frozen I had to cut it in half so it would fit in 6 quart lux I mixed a pack of beef stew seasoning and 2 cups of water and used rack cooked for 1 hour on manual high pressure the roast was tender and moist and flavorful I then put 4 large potatoes peeled and cut in chunks and 8 ounces raw baby carrots cooked again 8 minutes perfect so good thanks for recipe!! I don’t have a the trivet for my Instant Pot and my roast is frozen. Should I not put it in without the trivet? you can put it in, it will still be great. I’m doing a chuck roast which weighs slightly over 2 lbs and was FROZEN SOLID. After the first 70 minutes the meat was very tender and ready to eat. Added all of the vegetables (I cut up a large onion too) and let it sit in instant pot for 20 minutes after the final pressure cooking of 7 minutes (I added a lot more vegetables than what the recipe called for so I did 7 minutes instead of 4 which the recipe calls for) and the roast was absolutely amazing. This recipe rocks!! Why is ip better than roasting in oven? Doesnt electricity also cost more than using natural gas? 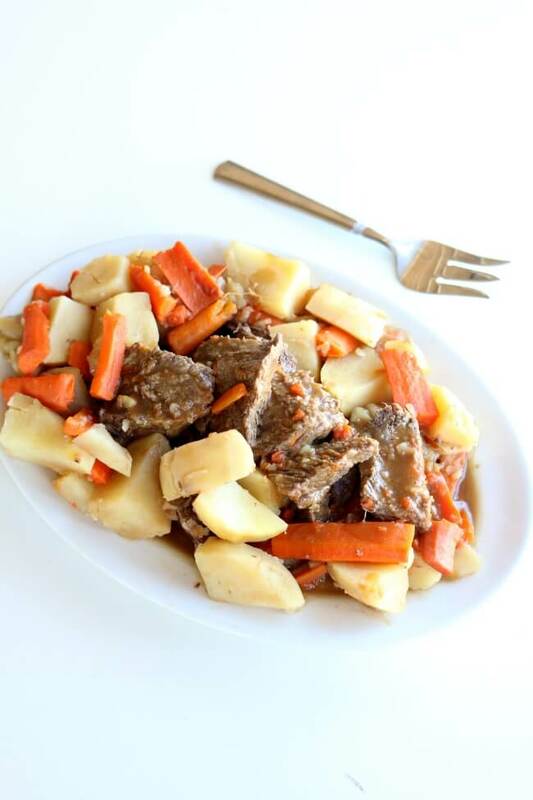 Alex – the idea is that you can cook a delicious pot roast in half the time. Nobody said it was better or worse. Are you trolling for an argument? Forgot to do the stars! My (frozen) rump roast was not done after 90 minutes, but I have no idea how big it is. We raise cattle and the locker does not list the weight when they package up the meat. I put it in for 15 more minutes. I hope that works so my husband can eat before he goes to work! I’m going to use Greek seasoning–the only kind we have. (In our opinion, if your steak needs seasoning, it’s not a good steak!) 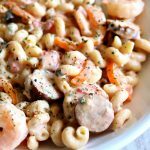 I’m giving the recipe 5 stars because of the easy-to-follow directions–it’s only my 2nd time using an Instant pot! Wow I’m surprised it wasn’t done! It must have been a big hunk of meat. I hope it turned out for you. Same issue here. Didn’t weigh it before cooking. Going to leave it in for 15 more minutes and see. I’m guessing it just needs to be in longer because it is a rather large hunk of meat. I am wanting to slow cook a frozen roast in my IP, How long do I cook it for?? Cook it on the highest slow cooker setting for 8-10 hours. Just wondering, does it take more/less time to cook certain beef roasts than others? I have a 2.33 pound boneless beef sirloin tip roast. Would I follow the time listed in your recipe? 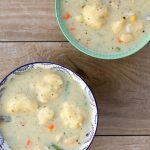 I have tried several of your soup recipes and haven’t been disappointed with any of them. calls for a 50 minute time. If your roast is frozen I’d add 15 minutes to that time. I’ve always cooked my pot roast in a cast iron pot on the stove with a can of beer. Can I sub the beef broth for the beer? Hi, our frozen roast came out dry, using our ninja foodi. We cooked it on HI pressure, 70min. The ninja cooks at a higher pressure. General time adjustment fur cooking frozen vs thawed meat?? Is there some general knowledge that will help me with cooking meats, both frozen and unfrozen? I think it would have been dairy if i bought an Insta pot..
Hi there, what size was the roast? What kind of roast was it? Just made this tonight and it was utter perfection, the best roast beef I have ever made, in any device! I did 90 minutes for a roast that was 2.8 lbs (frozen). It was PERFECT, fall apart tender. 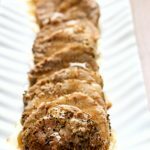 I never thought about using Montreal Steak seasoning on a roast, but i really like it – exactly right amount of seasoning and made yummy gravy. I did allow a 10 minute natural release each time (no quick release at all because I’ve heard it dries out meat) and I used baby carrots and baby potatoes. Highly recommend! Hi, when you said “natural release” means you don’t turn the bottom to evacuate? You just let the pot sit there and do nothing until the pressure comes down on its own. This was very good. I had a 2 lb. roast which I cooked for 70min. Will definitely make it again. The lux model doesn’t have the ability to switch pressure from high to low. The default is high so you should be fine! Tried this recipe, frozen roast high for 1 hour. The instant pot put up the message burn…tried again for the remaining time…burn. all of my liquid, measured as the recipe calls for was gone. Maybe less time for the roast next time. Wow really? That surprises me. What type of pressure cooker were you using? Did you use the trivet first to cook the roast? It is 100% not true that the cooking time does not need to be increased for frozen roast. You will waste a lot of time if you believe this. I have made the mistake now 3 times of believing these people who post these recipes who claim that you do not need to increase time and all you have to do it let the steam release naturally. Unless you want tough meat, you must increase the time by 20-30 minutes. A partially frozen 4.5 pound roast at 90 minutes, natural release was as hard as a rock. Had to put it back on for another 20 minutes. This is not the only page who give you bad advice. I don’t think anyone actually tests what they say or they need to reveal whatever their variables are that are allowing them to actually cook a roast to a “fall apart” state at these times. I roasted a pound-and-a-half roast at 60 minutes and it was from Frozen and it was perfect. I tried this recipe followed the instructions to a tee and my roast was completely raw. 2lb roast at 70 minutes from frozen did not work at all I’m disappointed. I just finished cooking a frozen 3.4lb roast for 80 mins and followed all other steps in this recipe and the meat was very slightly less than fall apart and was easy to pick apart with a fork. Just cooked 3.5 chuck roast for 80 minutes starting from FROZEN SOLID. And its freakin perfect! Delicious, I made my pot roast from frozen, I need to cook it longer, but I adjust. And would definitely make again, husband and I both enjoyed. So happy to hear this Ellen! My roast came out amazing! I followed the basic cooking instructions. The potatoes were soft enough to make VERY creamy mashed potatoes. The roast was extremely tender and not dry. Loved it! Thank you! I used a 2.5lb, partially thawed pork loin and set my IP on “Manual” for 75 minutes. I put the loin on the trivet because it was still a little frozen. I followed the directions to a T but the loin came out tough and dry. I will definitely be reducing the cook time next time. I still gave three stars because the flavor of everything was good and the gravy was good as well. I just think the cook time needs to be adjusted. A pork loin has very little fat, and would not cook the same as a beef chuck roast which is what this recipe is for. I think it’s unfair to the author of the recipe to rate a recipe 3 stars when you didn’t follow the recipe. While I agree that it’s unfair to rate a recipe that you didn’t follow, I have to wonder what kind of pork we’re talking about here. A pork *tenderloin* has very little fat, that’s true, but a pork *loin* roast has more than enough fat to cook well in an Instant Pot. That said, I’ve never cooked one from frozen, but I’ve cooked a couple in my new IP Ultra and they were delightfully tender. I just opened it to put the veggies in and took a little taste of the falling-apart meat. 🙂 Very happy! I am now waiting the 10+ minutes before releasing the pressure and it will be done just in time for our dinner. NICE!!! So happy you found this recipe. I have never been on your website before but I love reading all of the comments and replies. I’m not really good with the internet I’m just learning so when I make these comments or questions you say can I ask anything when I go on to your website just thought I’d ask thank you you sounded like you were just talking to a friend to help you out I thought that was really nice haven’t tried this recipe out I sure will. Thanks Mary Ann!!! Good to have you here. Was your roast boneless? Any idea on how much to increase time by for a roast with a bone? I have a 4 lb bone-in frozen roast. It was a boneless roast that I used. I’d increase the time by 10 minutes. Made this recipe tonight and it was perfect! So flavorful and the meat was cooked perfectly! Thank you! Delish. From frozen to on table in less than 2 hours. My kids loved it. This recipe is definitely a winner. I cooked a frozen 2.5 lb chuck roast and followed the recipe exactly as written. The cook time and seasoning was just right for us. Finally a recipe that all 3 of us really enjoyed. I’ve already called my daughter and told her how good it was. I emailed her the Web page so she can make it too. Just made it and I will be making it again! Thanks for sharing. I cooked my 2.3 pd roast for 60 minutes, check it and it was rare, so I cooked again 20 more minutes before adding the vegetable. I should have stuck to your recipe has I found it a bit too cooked, (my fault!) . The gravy is very very good. Thank you! WOW it exceeded expectations. Super tender and flavorful. Only things I changed, bumped up time to 1 hour 15 min. Didn’t have veggies, but added some dried apricots and prunes (I like a little sweet with savory) for that step. Then for gravy, after removing meat (but leaving in fruit) I added the cornstarch slurry, a can of golden mushroom soup, and a packet of french onion soup (and plenty of black pepper). Served with garlic mashed potatoes. This will not be the last time. Thanks a bunch! Congrats on the new IP! So fun! Should we have hit the meat button first? Our roast was so tough and dry and was a good one. 🙁 Everything else was great. Oh no! Sad day. I use manual/pressure cook button. What kind of roast? 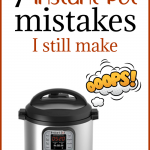 I’ve been really afraid to use my Instant Pot since I made terrible chicken mush in an attempt to make soup. This recipe really made me want to try, since I had a frozen roast. I used a pork roast on accident (I don’t make it often), and used a slurry of butter and flour because I was totally out of cornstarch. I hate when people have to make a ton of substitutions and they’re like “… And it was horrible!! !” Those people should have their keyboards taken away. Anyhow, not only did this work amazingly, but my son, who won’t eat roast, DEVOURED it. Your instructions were great and easy to follow, and the meat totally fell apart (and tasted great with the gravy)! My husband had two helpings. I’ve never made a successful roast before (as you may have been able to gather from the pork vs beef thing), but it was incredible! I’m definitely trying out more if your recipes!!! Thank you for making sense of my Instant Pot!!!! It seems easier to use now that I’ve made something!!! HOORAY!!!!! This is great news, Jeri. How do you add the veggies for 5 minutes? Once you open to put them in it has to come to pressure again, no? what am I missing? Thanks! yes, it has to come to pressure again. What store bought steak seasoning would you suggest? I always find that the best results are based on using the right ingredients. Thanks in advance for your help. I followed the recipe as written. The chuck roast was almost 3 lbs, it had been defrosted and I used Montreal Steak Seasoning. From start to finish it took approximately 2 hours, which is substantialy less than the time it takes in a crockpot. The roast was tender and flavorful. My husband loved it. I definitely would make this recipe again. Thanks Rose, so glad you liked it! If I don’t have a trivet, do I season the roast with half the seasonings, cook it and then put the veggies in with the other half of seasonings for 5 min? That would work. If your roast is frozen I like to get it off the bottom of the instant pot. Try using canning rings. I don’t have a trivet either. trying this out tonight with canning rings. Thanks for the suggestion! In the middle of making this now. My roast was frozen, barely over 3 lbs, and 5,780 ft elevation. After the hour, (I used the meat/stew setting) the roast is not ready. There was visible pink at the top. I added another 45 minutes with manual setting. I like roast to be fall apart tender. We will see how this goes. hope it worked well for you! You are at a high elevation!! At 9pm I decided I was craving roast. I used a 1.5 lb frozen solid tri tip roast. I set 60 min and by 10:30pm I was eating a tender falling apart roast! It was delicious! My teenage daughter and husband came to investigate and both had 2nd dinner with me! Good to know you can make tri tip in the instant pot!! Can I use chicken broth instead of beef broth? I only have chicken broth on hand. Also, can I use A1 seasoning for “steak seasoning”? That’s all I have too. You could definitely try it out. Maybe instead of the A1 use a homemade steak seasoning of paprika, pepper, salt, garlic powder, onion powder, coriander, dill and red pepper flakes. My instant pot does not have a button that says “manual” I’m wondering if that’s because mine is newer? So am I supposed to push the button that says pressure cooker ? Oh great! I wish they would keep it the same. It makes it hard to write recipes since the buttons on everyone’s cooker says something different! Thanks for posting this. I always assumed I just needed to push ‘meat’ for anything meat related. Now I know to hit ‘Pressure Cook’ instead. Very helpful! Thank you! Hi Dani, I hardly use any button besides the “manual” button! I’m def going to try this. 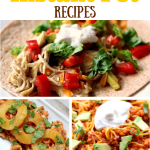 My only question is…..I have a 3 qt IP, so I’m assuming to cut all of these great recipes in 1/2, but the cooking time is the same right? Trying this recipe now. I couldn’t find the “manual” option so I used the Meat setting. Is this ok? Only 10 mins left and I noticed a comment saying that Pressure Cook was the same as manual so I changed it to manual for the last 10 minutes. Can you tell me what the difference is between Meat and Pressure Cook? Cooking frozen 4.3 lb roast for 95 minutes. Do you think that is enough time? yes I think that is enough time. The manual button is also called pressure cook button sometimes. The meat button will work very similar to manual button…so no worries! Does the cooking time change if the roast is thawed? Nope, keep the time the same. First off, this recipe is absolutely delicious, even the gravy. We love it. But one big confusion is the cooking time. I’ve made it twice (from frozen) and both times it needed a lot more than 60 minutes for the roast to cook. I checked the temp both times at 1 hour and each time the center of the roast was only a few degrees above freezing! So thawed but no where near cooked. The first time I put it in another 30 minutes and it was cooked. I was convinced I did something wrong which is why when I made it again tonight (for company) I tried 60 minutes. Sure enough I needed to add more time. I did 20 minutes extra and it was enough, then the extra 5 for the veggie. So all told, with having to bring up to pressure and release 3 times, the meal took hours and my poor company didn’t eat until 8 when I had planned to eat for 6:30! Interestingly, both my attempts were in two different pressure cookers! The first was the Power Pressure XL ( the as seen on TV one). I returned it after this meal cuz I thought it had a fault and I bought the Instant Pot! Lol! But both performed identically! Any advice? I think I’ll thaw it from now on but I sure love the idea of frozen. The first time my roast was 3lbs exactly. The second time I forgot to weigh it, but it wouldn’t have been far off that mark. Perhaps it was 4lbs at most. Wow! This is a great question that I don’t know the answer to. It’s so weird because my roast was totally cooked. I’m not sure what the difference would be. Did you use the trivet?? Your recipe says to, “Season it (the meat) with half of the steak seasoning.” Where does the other half go? As to Tara’s comment – your recipe calls for a 2-3 lb. chuck roast. I’m betting her roast was closer to 3 lbs. than 2 – hence the additional cook time. I’m either going to check with a meat thermometer or just go ahead and add 20 minutes. Place the meat in the bottom of the Instant Pot. Season it with half of the steak seasoning. Add in the potatoes and carrots and season them with the rest of the steak seasoning. I did a frozen 3pd roast for 90 mins…it was perfect…so pleased with the IP for sure..
What is your elevation where you live? The way I understand it is that it takes like 15 to 20 percent more time if you’re up at 3 to 5 thousand feet. This could be wrong but thats what I understand… I’m at a little over 4000 feet here. I’m just starting so I don’t have much experience to speak from. I had the same experience. LOVE making a roast from frozen cuz half the time I don’t remember to take it out the night before. I cooked it according to recipe- it was done but not fall apart tender like when I’ve used the crockpot on low for 8 hours- SO next time I’m going to do it for 2 hours ( if I can + that much time on manual?) and the potatoes and carrots were a bit crunchy after 6 minutes so I’ll do them for 10 I think. I know my instant pot ( pressure cooker) only goes up to 99 minutes.